At Pacific Science Center (PSC) we have a program through our Portal to the Public (Now POPNet) department where scientists, researchers, and medical professionals can join a network of Science Communication Fellows. These Fellows become partners with PSC and are asked to participate in volunteer events throughout the year. The Fellows go through multiple workshops and training presenters with our staff, where they develop interactive activities and practice communicating their research to general audiences. 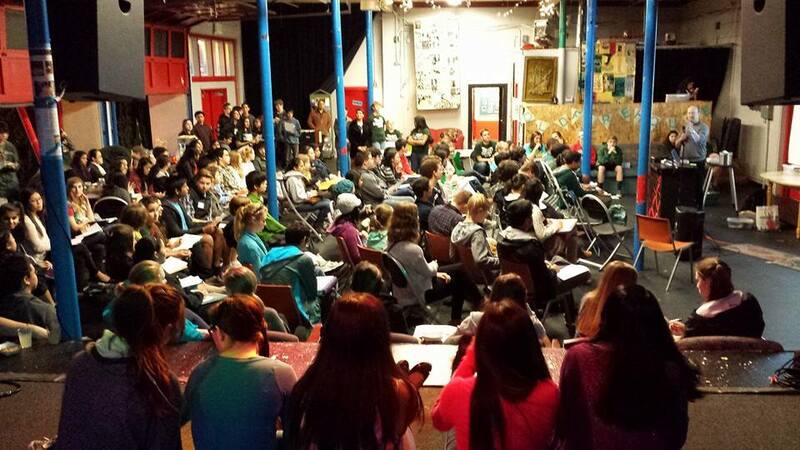 Teen Science Cafe in Seattle draws 150 passionate teens! Once their activities are done, we bring in teenagers from our teen work program (Discovery Corps). These teens evaluate the activities and researchers and provide feedback to improve the communication. In our Teen Science Café program so far we have only asked for speakers from our large network, as they have already developed an activity and practiced communicating with younger audiences. To prepare the speakers for the cafés, we generally have them meet once with specific members of our Youth Leadership Team, who watch the full presentation and activity then provide their feedback and suggested changes.